IRVINE, Calif. – No. 18 Dixie State softball held off a late Cal State San Bernardino rally on Thursday to claim a 5-4 victory in the 2018 West 2 Regional opener in Irvine, California. The Trailblazers (39-8) built a 5-0 lead before conceding two home runs for four runs in the top of the seventh inning as the Coyotes pulled to within 5-4. DSU would eventually end the rally as Janessa Bassett ran down a CSUSB drive to right center field to clinch the win. Dixie State retired the CSUSB side in order in the top of the first as Cambrie Hazel recorded two strikeouts in the frame. The Trailblazers took the momentum to the offensive side, scoring four runs on four hits and one Coyote error. Bassett started things off with a double to left center field. Brenna Hinck followed up the double with a single up the middle to move Bassett to third. Bailey Gaffin loaded the bases after being hit by a pitch, and Bassett scored on a Kenzie Sawyer groundout to shortstop. Jessica Gonzalez scored Hinck from third on an infield single to shortstop, followed by an RBI-single to center field by Kori Gahn. Gaffin scored from third on the play, while a CSUSB throwing error allowed Gonzalez to score an unearned run to push the lead to 4-0. The Coyotes placed a base runner on first with a walk in the top of the second, but Gonzalez ended the threat with a strike to Gaffin at second for her first caught stealing of the game. DSU retired the next two batters, including a leaping snare by Kaitlyn Delange at second base, to escape the inning unscathed. The Trailblazers added to the lead with one run in the bottom of the fourth. Dani Bartholf drew a leadoff walk, then moved to second on a Delange sacrifice bunt. Bassett then blasted her second double of the game to left center to score Bartholf and push the lead to 5-0. Dixie State retired six of the next CSUSB batters and seemed poised to wrap up the victory in shutout fashion. But the Coyotes had other plans. CSUSB catcher Jessica Brown hit a leadoff home run to cut the lead to 5-1 in the top of the seventh. After a walk and a DSU error, the Coyotes had runners on first and second with one out. Caitlyn Olan entered as a pinch hitter, then promptly hit a three-run home run to cut the lead to 5-4. Alexis Barkwell entered the game to pitch for Dixie State, and before she had a chance to record an out, Gonzalez fired to Gaffin at second for another caught stealing and the second out of the inning. Two batters later, Ashley Leffingwell drove a ball to right center field for CSUSB. The ball seemed destined to find the gap, but Bassett chased it down and made the catch on the run to seal the 5-4 win. Bassett led the way at the plate with two doubles and an RBI, while Hinck and Sawyer each finished with two hits apiece. Hazel (17-3) earned the win in the pitcher’s circle, allowing four runs on five hits with seven strikeouts in 6.1 innings pitched. Barkwell earned her first save of the season after entering with one out in the seventh. 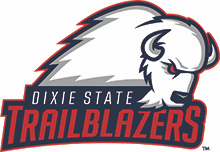 Dixie State advances to play the winner of Concordia-Irvine and Academy of Art on Friday at 10 a.m. Pacific Time (11 a.m. MT) in Irvine.